The featured composition for this noon hour concert is a 25-minute piece titled Mama’s Painting: Louis Riel’s Dream by Dr Karen Sunabacka. The piece is inspired by an unfinished collection of paintings by her Métis grandmother Lenore Clouston titled “Louis Riel’s Dream.” The five paintings were to highlight the history of Western Canada through the stories of the indigenous peoples, illustrating the clashes of cultures and politics in Canada and pointing to a future where people of all races could live in harmony. A seminar and singers' workshop for choirs, conductors, and fans of choral music led by celebrated Latvian composer Ēriks Ešenvalds. Hear Ēriks speak about his life and process as a composer, then actively participate with the host choirs as Ēriks leads attendees through singing 1-2 of his works. Fee includes scores*. This workshop is presented in partnership with conductor Mark Vuorinen, Conrad Grebel University Choirs, and the Grand Philharmonic Choir. If you're in Grade 10 and planning to attend university, you and your parents are invited to learn what you can do now to prepare. Before attending this University of Waterloo event, join us at Grebel for a pizza dinner and learn about how Grebel's residence and academic programs can enhance the University of Waterloo experience! 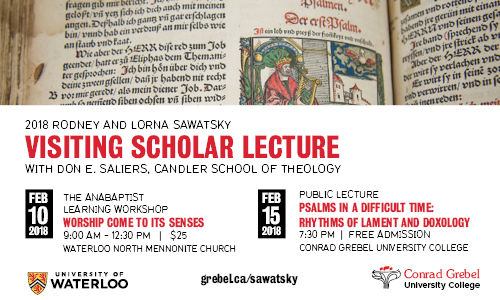 Grebel is pleased to welcome Donald E. Saliers as the 2018 Rodney and Lorna Sawatsky Visiting Scholar. Don will offer a public lecture titled, "Psalms in a Difficult Time: the Rhythms of Doxology and Lament," on Thursday, February 15th. The Cardinal Consort of Viols will be performing 'Heart's Ease', a programme full of some of their favourite pieces. The programme will feature some of the most beautiful music ever written including works by Jenkins, Byrd and Farina. 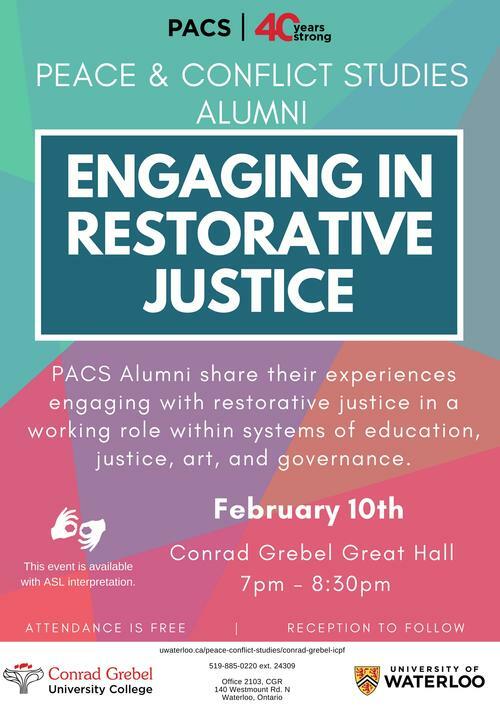 This event is part of the Intercollegiate Peace Fellowship Conference, a three day conference that explores the meaning, history, and practice of restorative justice. This is a public event that is free to attend and open to all. This event is available with American Sign Language (ASL) interpretation. 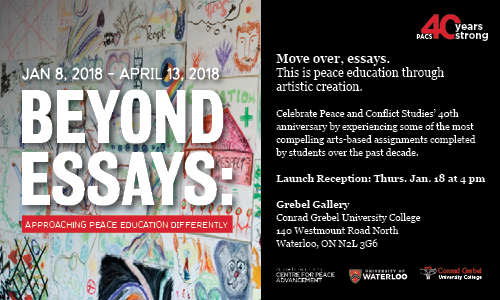 There is a Reception to follow this event in the Conrad Grebel Upper Atrium at 8:30pm. This is a public event that is free to attend and open to all. This event is available with American Sign Language (ASL) interpretation. 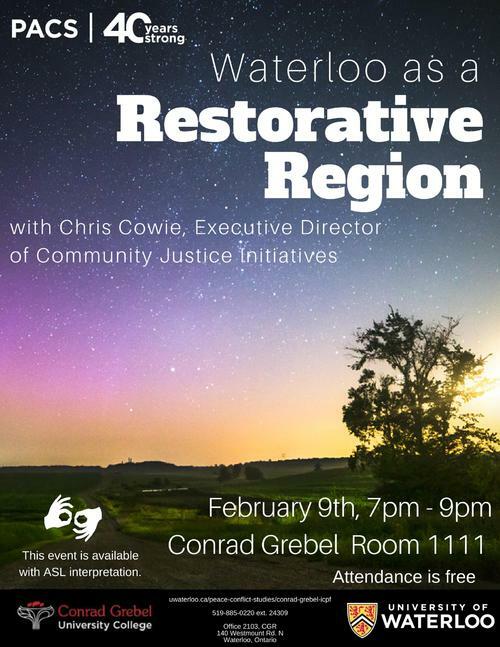 In this event Chris Cowie, the Executive Director of Community Justice Initiatives (CJI) explores the steps that Waterloo has taken toward becoming a restorative region, and how other regions can make similar moves. The Intercollegiate Peace Fellowship (ICPF) conference began in 1948 at Goshen College and represents the peace societies and other peace and justice interested students of Mennonite and affiliated colleges/universities in Canada and the United States. Each year, students organize and host a rotating conference that brings students together to learn from their diverse university experiences. 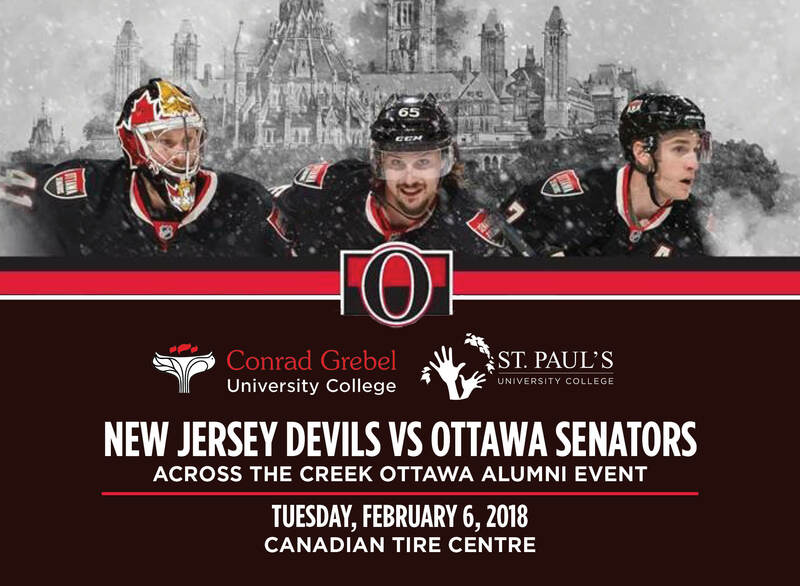 Tuesday, February 6th - Grebel and St. Paul's Alumni in Ottawa! Join Fred W. Martin, Director of Advancement at Conrad Grebel at 6:30 p.m. for an Alumni Meet and Greet at The Canadian Tire Centre. Your $60 ticket includes Ledge seating, a hot sandwich from the carvery station, unlimited salad bar, a space to mingle with other alumni and access to a private bar area. The Ledge opens 90 minutes before game time and food will be served until the end of the first intermission. Puck drops at 7:30 p.m.